The Naval Officer who specializes in sensitive information is called an Intelligence Officer. The Intel Officer will be monitoring and analyzing activities that pose a threat to national security - everything from drug smuggling, illegal immigration, arms transfers, and enemy allied movement of warships at real time from a variety of sources (human, satellite, photo / video). Sharing this information with high level military and political decision makers with assessments and recommendations is one of many of the high stress job requirements of the Naval Intelligence Officer. Age: At least 19 and less than 35 at time of commission. No waivers. Education: BA/BS in International Relations, Political Science, Gov’t, Engineering, Physical or Natural Science, and Comp. Science preferred. Training: Navy Intelligence Officers are made many ways. One can obtain the Naval Intelligence Officer career path coming from ROTC, U.S. Naval Academy, and OCS. You can also already be in the Navy as an enlisted member or officer in a different career path and lateral transfer into the Intelligence field. Once commissioned, the officer will attend Naval Intelligence School that last five months in Virginia Beach, Virginia. Once trained in the basics of Naval Intelligence, the Naval Intel Officer will receive information and directed by the Office of Naval Intelligence. Navy Intelligence is consider a Restricted Line Officer which requires special skills but less rigorous medical and vision requirements. Depth perception not required. Color vision not required. - PRK and LASIK only eye surgeries waivable. Service Obligation: 4 yrs Active from commissioning or de-enrollment (from flight program). - interview with Intel Officer enhances pkg. - foreign language skills are not required. - Applications will only be considered if available for OCS within 24 months unless applying for BDCP. Community Overview. One of the keys to conducting successful U.S. military operations is timely and accurate knowledge of an adversary's strengths, weaknesses, capabilities and intentions. This knowledge, or intelligence, is essential to preserving our national security. Naval intelligence officers provide tactical, strategic and operational intelligence support to U.S. naval forces, joint and multi-national military forces, and executive-level decision makers in our national government. A career as a Naval Intelligence officer is exciting, challenging, and rewarding. You'll join hard-working professionals ready to meet the challenges of a rapidly changing strategic landscape. You'll also reap a deeper reward - the sense of satisfaction and pride you'll gain as a member of the team that is quietly and competently protecting your nation's security. Specific job elements for​ a first tour. Following graduation from basic intelligence training and receipt of a special intelligence security clearance, you'll go to an operational afloat or shore tour. 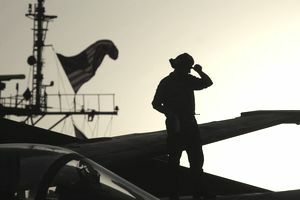 Your first assignment is normally 24 months in length and is typically at an aviation squadron, air wing staff, or onboard an aircraft carrier or amphibious command ship. If you go to a shore command, you will also spend 24 months at a Joint Intelligence Center located at home or abroad. From the start you'll be in an important position of responsibility, supervising the collection, analysis and dissemination of intelligence information critical in carrying out your command's mission. You will develop skills in leadership, management, analysis and communication that will enhance your personal and professional growth. -Operational Intelligence - Provide day-to-day intelligence analysis and support to naval, joint and multinational military operations afloat and ashore. Scientific and Technical - Analyze the technical strengths and weaknesses of foreign weapons systems. - Intelligence Collection - Manage the prioritization of requirements and the tasking of resources to collect intelligence information from various imagery, electronic, communications, acoustic, human and other sources. - Staff Support - Manage intelligence programs, analyze intelligence, produce support documents and develop plans for intelligence operations. - Political/Military Affairs - Serve as a regional area expert on a headquarters station or as a naval attaché in an embassy. - Civil Maritime Intelligence - Monitor and analyze maritime activities that pose a threat to national security, such as drug smuggling, illegal immigration, arms transfers, environmental mishaps and violations of UN sanctions. - Information Systems and Telecommunications - Assist in developing, testing and maintaining hardware and software, ensuring real-time, secure dissemination of intelligence information to combat forces worldwide. Active duty obligation. 4-year active duty commitment after commissioning. Eight years total active and inactive duty commitment. Training Pipeline following commission. After commissioning, your career as a naval intelligence officer begins at the Navy and Marine Corps Intelligence Command in Dam Neck, Virginia, where you will attend a 5-month basic course of instruction. You will be given a good foundation in areas such as​electronic, anti-submarine, anti-surface, anti-air, amphibious and strike warfare; counter-intelligence; strategic intelligence, air defense analysis and combat mission planning. Special pay/bonuses. Retention bonuses are offered depending on the geo-political situation of the U.S. Military and the need for more fully trained intelligence professionals. Basic eligibility requirements. Applicants must be prospective or college graduates. Preferred fields of undergraduate study are international relations, political science, government, engineering, physical science, natural science, computer science or other academic fields related to intelligence. Must be at least 19 and less than 35 at commissioning; must achieve qualifying scores on the Aviation Selection Test Battery; must qualify for appointment by passing standard Navy physical examinations; vision correctable to 100 percent BE, provided the refractive error is no greater than 8.0 diopters; must have normal color perception; must apply 24 months before or any time after college graduation.